Ribosomal ribonucleic acid (rRNA) is the RNA component of ribosomes, the molecular machines that catalyze protein synthesis. Ribosomal RNA constitute over sixty percent of the ribosome by weight and are crucial for all its functions – from binding to mRNA and recruiting tRNA to catalyzing the formation of a peptide bond between two amino acids. Even the structure of a ribosome is determined by the three-dimensional shape of its rRNA core. Proteins present in the ribosome serve to stabilize this structure through interactions with the core. Ribosomal RNA are transcribed in the nucleus, at specific structures called nucleoli. These are dense, spherical shapes that form around genetic loci coding for rRNA. Nucleoli are also crucial for the eventual biogenesis of ribosomes, through sequestration of ribosomal proteins. Ribosomal RNA was discovered during cell fractionation experiments investigating the role of RNA viruses in causing cancer. Fractionation is a method where cell membranes are carefully and selectively removed while keeping the function of cellular organelles intact. This homogenized cytoplasm is then centrifuged at increasing speeds so that organelles separate according to density. The initial experiments that revealed the presence of rRNA extracted a fraction that was thought to represent a new sub-cellular organelle, microsome, specializing in protein synthesis. Later, it was seen that it was the presence of ribosomes on endoplasmic reticulum that led to the detection of RNA in these samples. Since ribosomal subunits and rRNA were first detected through differential centrifugation, they are still identified by their rate of sedimentation, through the Svedberg coefficient. However, since these are not measures of molecular weight, the coefficients cannot be directly added. For example, in prokaryotic ribosomes when the 50S larger subunit and 30S smaller subunit come together, the complex has a Svedberg coefficient of 70S. Both prokaryotic and eukaryotic ribosomes are made of a larger and smaller subunit and these two units come together during mRNA translation. The smaller subunit in prokaryotes is made of an RNA molecule about 1500 nucleotides in length with a Svedberg coefficient of 16S. Together with ribosomal proteins, the smaller subunit has a sedimentation rate of 30S. This is paired with the larger subunit, having two RNA molecules – one that is nearly 3000 nucleotides (23S) in length and the other is a short sequence of 120 nucleotides (5S). These RNA molecules are accompanied by proteins that give rise to the larger 50S subunit. The eukaryotic ribosome is made of a 60S and a 40S subunit. There are two short rRNA molecules less than two hundred nucleotides in length (5S and 5.8S), and two RNA molecules that are much longer – one that has over five kilobases (28S), and another nearly two kilobases (18S). In all, the eukaryotic ribosome has a Svedberg coefficient of 80S. In addition, eukaryotic cells also have rRNA in mitochondria and chloroplasts. Ribosomes can be associated with the endoplasmic reticulum or be present as free floating complexes in the cytoplasm. The primary function of rRNA is in protein synthesis – in binding to messenger RNA and transfer RNA to ensure that the codon sequence of the mRNA is translated accurately into amino acid sequence in proteins. To achieve this, rRNA has a distinctive three-dimensional shape involving internal loops and helices that creates specific sites within the ribosome – the A, P and E sites. The P site is for binding a growing polypeptide, the A site anchors an incoming tRNA charged with an amino acid. After peptide bond formation, the tRNA binds briefly to the E site before leaving the ribosome. In addition rRNA also has sites for binding to some ribosomal proteins and careful analysis has demarcated the exact residues in both the RNA and protein. Ribosomal RNA are also expressed in every cell of all extant species. The sequence of the core catalytic sites are also highly conserved making rRNA an excellent tool for the study of taxonomy and phylogenetics. There is a difference in the rate of evolution of residues on the surface and interior of rRNA, and nucleotides involved in core catalytic activity, such as in the formation of a peptide bond, appear to have predated the appearance of life on earth. The extent to which two species differ in rRNA sequences can give a good estimate of their evolutionary distance. Many antibiotics target prokaryotic rRNA and recently the binding sites for antibiotics such as streptomycin and tetracycline on rRNA have been indicated. It has also been shown that antibiotic resistance often stems from point mutations in these binding sites. For instance, the resistance of Euglena and E. coli to streptomycin stems from mutation in the 16S rRNA sequence. Similar results were found for the resistance of Streptomyces to Spectinomycin. Tetracycline resistance appears to come from mutations in the 30S rRNA. In a new dimension to the function of rRNA, its precursors (preribosomal RNA) have been implicated in the generation of micro RNA that mediate inflammation and cardiac disease in response to mechanical stress. The mechanisms of this activity are still being elucidated. Translation of the mRNA sequence requires the involvement of rRNA at every step – initiation, elongation and termination. Messenger RNAs carry the genetic information coded in the DNA into the cytoplasm where the nucleotide sequence is read by ribosomes in stretches of three bases called codons. Four nucleotides, Adenine, Uracil, Guanine and Cytosine, can be arranged to form a total of sixty-four triplet codons. Each codon corresponds to a single amino acid and thus codes for the protein sequence. Prokaryotic translation begins with the 16S rRNA base pairing with the Shine-Dalgarno consensus sequence in mRNA. Since the Shine-Dalgarno sequence is 6-10 nucleotides upstream of the start codon, binding with rRNA allows the start codon to be positioned within the ribosome. This interaction is mediated by other proteins, which also recruit the larger ribosomal subunit and subsequently, the first codon is translated. In eukaryotes, eukaryotic Initiation Factors 4E and 4G (eIF4E and eIF4G) bind to the 5′ end of the mRNA, recruiting both the smaller subunit of a ribosome and a tRNA carrying methionine. The ribosome scans the mRNA to locate the start codon, after which the initiation factors dissociate from the translation machinery. Every new amino acid, attached to a tRNA, arrives at the A site. Base pairing between the codon on the mRNA and the complementary anticodon on the tRNA changes the conformation of three residues on the 16S rRNA. These residues interact with the anticodon, stabilize the tRNA-mRNA complex and enzymatic activity of the rRNA positions the aminoacyl-tRNA fully within the A site. The polypeptide that has been synthesized so far is bound to the P site on the ribosome. Ribosomal RNA in the larger subunit catalyzes the reaction that forms a peptide bond between the amino acid in the A site and the growing polypeptide chain in the P site. Polypeptide synthesis is terminated when the ribosome reaches a stop codon, and rRNA catalyzes the addition of a water molecule to the polypeptide in the P site. Consensus sequence – An order of nucleotides or amino acids found in each position in a sequence alignment. It is derived from aligning similar sequences across different species. Endoplasmic reticulum – An organelle within eukaryotic cells that is involved in protein synthesis and lipid metabolism. mRNA processing – Modifications to the primary mRNA transcript in eukaryotes that involves capping, splicing and polyadenylation. 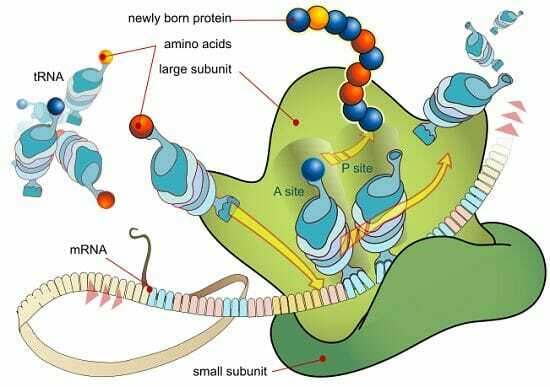 Ribozyme – RNA molecules that function as enzymes, having catalytic activity. 1. What does the Svedberg unit measure? C is correct. It represents a unit of time equivalent to 10-13 seconds. Though it is affected by molecular weight, density and volume, it is not an accurate estimate of any of these properties. 2. Why is rRNA used as a tool to study taxonomy? A is correct. It is expressed in every cell of every species and each residue within the rRNA appears to evolve at a distinct rate. Analysis of these changes can give an estimate of evolutionary distances between species. Some enzymatic domains on rRNA are said to predate the appearance of life on earth. 3. How many codons are formed through nucleotide triplets on mRNA? B is correct. Four nucleotides can be arranged as triplets in sixty-four ways. Since there are only twenty amino acids found in nature, many different codons can represent a single amino acid.